The home improvement giant is one of the most efficient companies on the market. News flash: Home Depot (NYSE:HD) is minting money right now. Earnings in the last fiscal year passed $7 billion -- up from $3 billion in 2011. But, as the billionaire investor Warren Buffett likes to point out, earnings alone don't tell us squat about a business unless we also know how much capital was needed to produce those profits. For that information, we need to look at return on invested capital, or ROIC, which is profit expressed as a percentage of long-term debt and equity. A consistently high ROIC is evidence of a good management team that deploys capital efficiently while making judicious use of debt. Home Depot happens to boast not only the strongest ROIC in the industry, but also one of the highest returns on the stock market. The retailer's ROIC was 29% over the past year, 4 full percentage points above the prior-year period and double what its closest rival, Lowe's (NYSE:LOW), could manage. The figure has roughly doubled for Home Depot since 2011, when it was below 15%. Lowe's, meanwhile, hasn't enjoyed nearly the same rebound. Among the nation's largest companies, Home Depot stands out as one of the best in this regard. Its ROIC places it at the top within the Dow, essentially tied with Apple and Boeing. Data source: Company financial filings and Finviz . Like many of these giants, Home Depot has relied heavily on borrowing to increase shareholder returns. Long-term debt has risen to about $21 billion from $11 billion in the past five years. Its debt-to-equity ratio has surged from 60% to over 300% now. Business efficiency has spiked over that time, though, suggesting that management has been putting the cash to good work. Working capital is down even though the sales base has spiked. And inventory turnover has improved to 4.9 times per year from 4.3 times in 2011. Meanwhile, Home Depot's share count has plunged by 18% as management spent billions on stock buybacks. As a result, per-share earnings are up 121% even though net income rose by just 80%. Executives prioritize capital allocation as a key part of running the business. In fact, it's one of the retailer's three biggest initiatives. Home Depot advances its efficiency metrics, it says in its 10-K report, by "building best-in-class competitive advantages in our information technology and supply chain to better ensure product availability to our customers while managing our costs." Home Depot's latest logistics initiative is a network of rapid deployment centers that involves deep collaboration between the company, its suppliers, and its transportation providers. The strategy should yield a big reduction in the average time between when a product leaves a supplier and when it arrives on a Home Depot shelf. 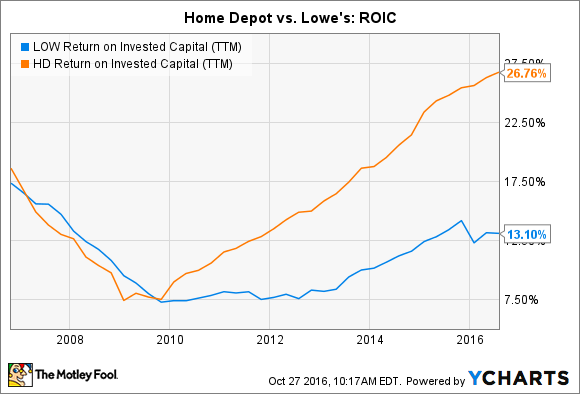 Inventory management may not be the most exciting thing Home Depot is working on, but it is the project that's most likely to keep capital returns churning higher. CEO Craig Menear and his executive team believe that there is plenty of room for ROIC to improve in the coming years. They project achieving a whopping 35% by 2018, the same year that the company expects to pass $100 billion of annual sales while hitting a 15% operating margin. Debt will probably play an important role in that ROIC growth. But investors have every reason to believe management will continue to make smart choices about where to best deploy those funds for their benefit.